Asian elephants are suffering greatly at the hands of poachers. The illegal elephant trade is flourishing in Thailand and Burma, where wild elephants are captured and sold for their ivory or for tourism. Baby elephants are the most valuable commodities in elephant tourism, but they aren't required to be registered until they reach eight years old. Wild elephants enjoy significant legal protections, but outdated laws and poor documentation make it difficult to distinguish between the "wild" and "domesticated" elephants, which can still be legally traded. Because of this loophole, baby elephants captured in the wild are passed off as domesticated with no documented proof. Requiring that babies be registered at birth is one compelling way to curb the trade and prove where the babies belong. Write to the Department of National Parks, Wildlife and Plant Conservation (DNP) in Thailand asking they enforce registration at birth. The illegal elephant trade is surging on in Southeast Asia. 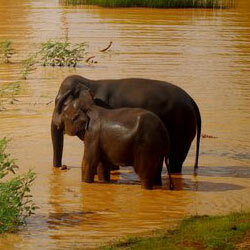 The elephant populations in Burma and Thailand are suffering due to extreme poaching. Wealthy traders take the elephants and use them for their ivory or in the tourism industry in elephant trekking. The elephants that are captured are held in captivity and are subject to nothing short of torture, whether their tusks are cut from their faces or they are forcefully and painfully trained to obey their masters. Right now, elephants aren't required to be registered until they reach eight years of age. But if all elephants were registered at birth, keeping them in the wild with their parents might prove a much easier task. Please do all you can to make sure domesticated elephants are registered at birth, distinguishing them from their wild counterparts, so that these precious animals can thrive in their homes and avoid the dangerous black market. That's 71,194 signatures! Let's keep the ball rolling.